India's Blackout A Reminder Of How Far We've Come The power outage in India this week, which darkened the lives of nearly 700 million people, brings to mind the time I spent there. It was nearly 50 years ago, when India was still a young democracy and power outages were as common as enjoying a cup of dark, sweet Indian tea. 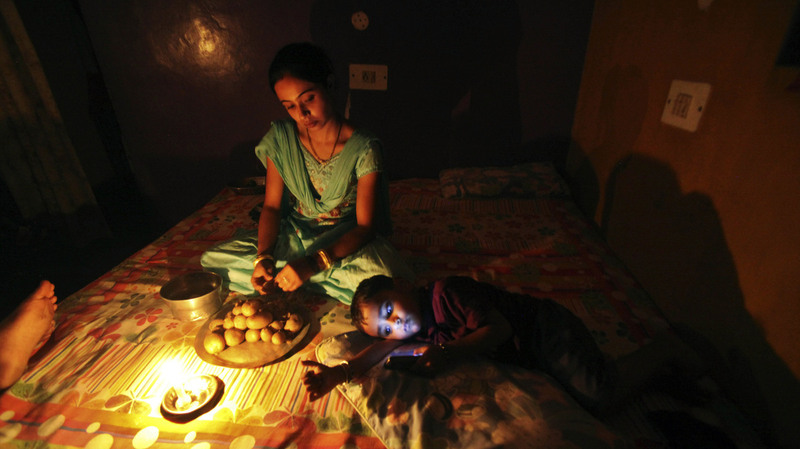 A girl prepares a meal by candlelight in Jammu, India, during the massive blackout last week. This week, the world's largest democracy experienced the world's largest power outage. Nearly 700 million — that's more than half a billion — Indians were said to have been without power Tuesday. No air conditioning. No traffic lights. No metro system. Most of the power is back now, but the outage had resonance for me from the long-ago years when I lived in New Delhi and experienced power failures almost as regularly as I did steaming cups of dark, sweet Indian tea. Fifty years ago, most Indians had no electricity. Power belonged — politically and financially — to the rich. As the young wife of a modestly paid U.S. civil servant, I, most improbably, was rich in comparison to the bulk of the Indian population. And yet, most evenings, standing around at receptions or visiting friends, we'd hear a low groan, as the lights and air conditioning flickered, then died. We just chatted away to the faint clink of ice melting in our drinks. Chatting, with trickles of sweat running down our faces and fancy silk dresses and saris. We joked about the shoebox-shaped power station in town. How the guy in charge of it probably had to walk from one end to the other to flick some switch to keep the power on. We figured he stopped for a tea break en route. We considered getting him roller skates and a thermos to keep him — and us — happier. This may sound heartless to you. It was well-intentioned joking in those days of can-do American spirit, when you went overseas to do good — to help development, in an ancient country that had been independent for just 20 years. To introduce new ideas about agriculture and water and sanitation — try to make things better. Today, the power problems in India are the bittersweet fruits of freedom and development. A middle class, which barely existed when we were there, is thriving, driving, expecting power for their subways. They're living in ways which had been available to just a privileged few. Deep discrepancies remain, but the fact that the blackout came as a shock to so many millions is a revelation — difficult as it was to experience — of just how far the world's largest democracy has come.